At 20 years old, time and arthritis caught up with bobcat Tractor and it was time to help him move on to the pride on the other side. That was how he was named. For good reason, it never crossed their friends’ minds that they would purchase a bobcat as a pet. Upon arrival, we had to encourage him to eat raw meat by wrapping green beans in deli meat. Luckily with a lot of patience, we were able to transition him to a proper diet for a predator so that he didn’t have organ failure or a vitamin deficiency. Tractor didn’t understand why he had to start a new life at the Sanctuary. And he blamed us. He began showing his wild nature and never warmed up to his human caregivers. Instead, he lived his life befriending other cats and helping them adjust to sanctuary life. Over the years, he befriended Scooter, Bella, Libby and Athena. 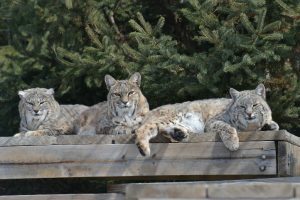 In his later years, he lived with Athena and Libby and could be found curled up in the hammock with them. When he was in his early teens, he was diagnosed with hip dysplasia, a painful and debilitating disease. A hip replacement could not be performed, since the aftercare physical therapy would not be possible. So, specialists performed hip denervation surgery, alleviating the pain from the disease. What a difference that made for Tractor. He could jump, run and climb again! Even though Tractor didn’t show his affection towards us humans, we loved him with all our hearts. And to show that, we’d provide him his favorite treat – cucumbers! 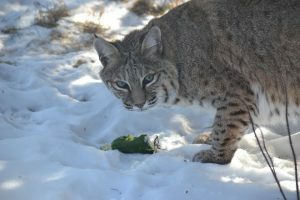 At first his roommates, thought he was crazy and couldn’t figure out why a bobcat would be so excited over a vegan treat. But soon they joined in and all enjoyed their ongoing vegetable snacks and enrichment. Thank you, Tractor, for being such a good friend to new residents who needed a little reassurance. Your work is done and now you get to move on to your wild life. Enjoy your new found freedom. You will never be forgotten. We love you. 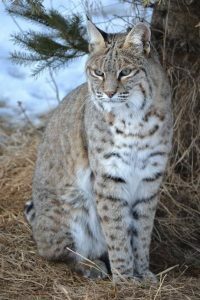 Tractor, a bobcat, was living in a suburban home where he was making it difficult to have visitors and was marking territory by spraying. He was bonded to his owner and initially had a difficult time accepting his new caregivers. But, now that he’s been with us for many years, he loves living wild at heart. 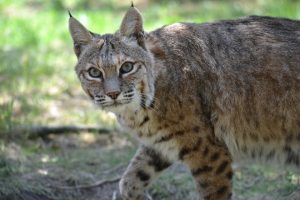 He lives peacefully in a habitat with other bobcats and enjoys the freedom to do as he pleases here at the Sanctuary. People always wonder about the names some of our cats have. When his owner told her father, “I got a bobcat.” The father’s response was, “Why do you need a tractor?” And the name stuck. Tractor likes all sorts of toys including balls, hammocks and catnip boxes. But his favorite things in the world are vegetables – he’ll pass up a piece of chicken any day for a cucumber or pumpkin. It’s a great form of enrichment for him and keeps him busy as the other bobcats watch, wondering what in the world he’s doing! In 2010, Keepers noticed a change in Tractor’s walking due to arthritis. Specialists were able to perform an innovative surgery to help Tractor. Read about Tractor’s hip surgery.